Building Biology | Energy Saving Lamps – have we been Green-Washed? Energy Saving Lamps – have we been Green-Washed? 17 Jun Energy Saving Lamps – have we been Green-Washed? Like you, I have often questioned the validity of working under fluorescent lights day after day; but hey… they are better for the environment or so we are meant to believe. I was researching the health effects of energy saving lamps for the second edition of my book: Healthy Home, Healthy Family, only to discover that, in stark contrast to the wads of information on energy efficiency, there is very little data on the adverse health effects of lighting. The new era of “green marketing” is remarkably hypocritical when you consider that compact fluorescent lights contain toxic mercury vapour and hazardous electronic components that end up in landfill and contaminates our air and water ways. Mercury vapour is one of the worst heavy metals a person can be exposed to as evidenced by the Minamata disaster in Japan and the phasing out of amalgam fillings. If you break one of these lamps at home, the council’s recommendations reads like an environmental catastrophe – evacuate the room, double bag the components, consider getting professionals dressed in tyvek suits, gloves, eye protection and appropriate respirators to clean up the site! 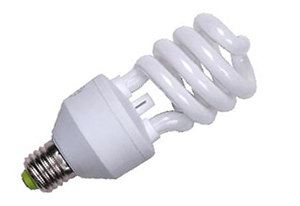 Why on earth anybody would manufacture a toxic product like compact fluorescent lamps, let alone convince governments to legislate its use in the name of being ‘environmentally friendly’ is paramount to insanity. Even more absurd is the fact that the healthiest form of lighting is the now extinct incandescent bulb! Over the years I have been approached by many people who suspect their lights are making them sick; each going into specific detail about the symptoms they experience when they are in close proximity to an energy saving lamp. Redness and itching of the skin, a feeling like electricity on the skin to headaches and an inability to concentrate. I now suspect, that most of these people were Electrically Sensitive (EHS). Of more concern is new research from Germany demonstrating that some of these lights may emit harmful electromagnetic fields that can bring on migraine headaches and epilepsy in susceptible individuals. Ironically my own conclusion after researching this topic is that the healthiest type of lighting is the incandescent bulb – yes that’s right, the one that was phased out because it was not energy efficient or environmentally friendly! Want to know more? I have a Lighting Comparision Chart in my book Healthy Home, Healthy Family.